Do you need a industrial radio control for your winch, pump or generator? Tyro Remotes is your professional partner for every application. We don’t just offer remote radio control for individuals; we also supply customer-specific remote controls and receivers and we develop OEM-solutions for manufacturers. Why a wireless remote control? 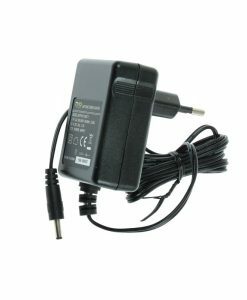 Everyone is familiar with the problems associated with wired remotes and control panels; they never seem to reach far enough. They limit your freedom of movement. 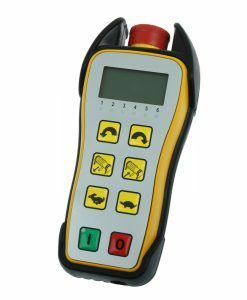 With industrial radio remotes from Tyro Remotes these all to familiar limitations with equipment, vehicles, winches, etc. will be a thing of the past. Whether it’s an emergency stop button, a receiver with an RS232 or Profibus-interface; the radio remote systems with 433 MHz, 868 MHz and 915 MHz frequencies offer the right solution for every application or task. You have the choice to order a 2- or 4-channel transmitter and receiver all the way up to transmitters and receivers that can control more than 256 channels. Options such as a display, feedback and individualized interfaces ensure that we can provide you with the proper transmitter and receiver. 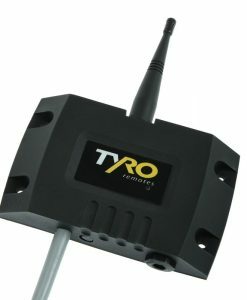 When circumstances warrant unique requirements for a radio controlled remote, Tyro Remotes is the right supplier for you. 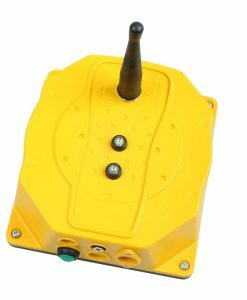 With us you will find waterproof (IP65 to IP68) transmitters and receivers which are available in broadband and small band and have a range of up to 1200 meters. Through an LCD or display you can also read reliable feedback about your transmitter, on your receiver. Simple tasks and complex applications are no problem for the remote controls by Tyro. With no impact on safety. You can combine our various transmitters and receivers with each other. We understand that it is very challenging to know, with certainty, which solution is best for your application. Which is why we encourage you to contact us so we can come up with the right and most cost effective solution for you.